A footballer has been acquitted of racially abusing an opposition player before a mass brawl. Prosecutors had alleged Sheffield Wednesday's Fernando Forestieri insulted Mansfield Town's Krystian Pearce during a pre-season friendly. Mansfield Magistrates' Court heard Mr Pearce had to be restrained during a "40-man brawl". Mr Forestieri, 29, was found not guilty of racially aggravated harassment and using threatening words or behaviour. District Judge Jonathan Taffe ruled Mr Pearce may have misheard Mr Forestieri as "it was very loud" at the ground on 24 July. 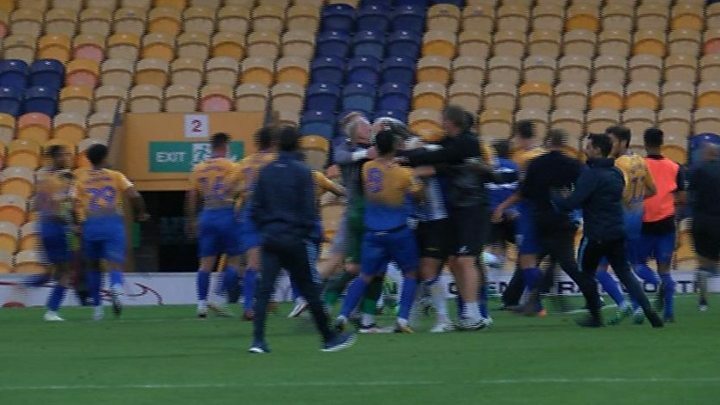 The court heard the incident began with a foul by Mr Forestieri on a Mansfield player which prompted his team-mates, including Mr Pearce, to react. The prosecution alleged this led to a "heated exchange of words" and while Mr Forestieri was speaking mainly in Spanish, he used derogatory racial terms. Mansfield manager David Flitcroft told the court he felt he had to pull Mr Pearce away from Mr Forestieri after being told about a "racist incident" by the fourth official. Mr Pearce confronted Mr Forestieri after the match and the Owls star denied being racist, and apologised if the defender had "misheard". Giving evidence, Mr Forestieri also denied using any racist terms. He said: "No, I never said that, I'm not like that. I was very sad because I'm not a racist. The first rule in football is to respect your colleagues." Mr Forestieri was banned for three games and fined £25,000 as a result of the brawl. On Twitter after the verdict, Mr Forestieri said he felt "vindicated by the decision of the judge".